Wen Zhengming 文徵明 (1470-1559), Copy of Zhao Bosu's Second Ode to the Red Cliff 仿趙伯驌後赤壁圖 (detail) (1548, original c 1132-1182), ink and colours on silk handscroll, 31.5 x 541.6 cm, National Palace Museum 國立故宮博物院, Taipei, Taiwan. Wikimedia Commons. 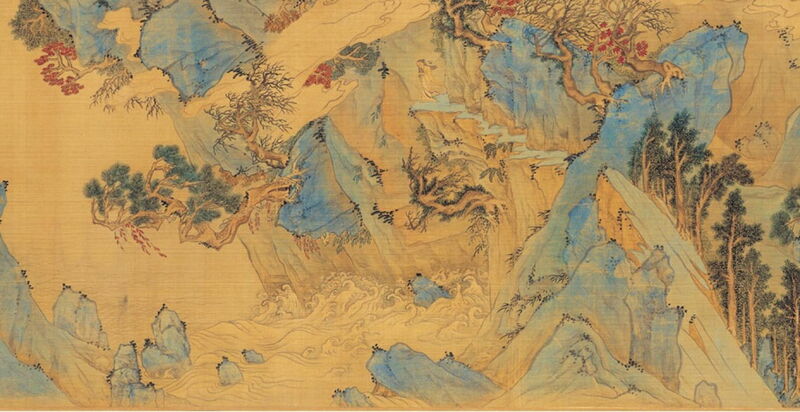 My second example of Chinese narrative painting, drawn from Cédric Laurent’s study, is, at first sight, another exquisitely beautiful handscroll painting of a landscape, with its forests, rugged hill country, and rivers. It was painted in 1548 by Wen Zhengming 文徵明 (1470-1559), and at the end of the scroll his son Wen Jia (1501-1583) has written an account of the background to this painting. It is apparently a copy of an original by Zhao Bosu (c 1123-1182, not to be confused with his brother Zhao Boju). The owner of this original, a friend of Wen’s, was concerned because a local official wanted to present that handscroll to the son of the powerful Grand Secretary, to curry influence. Wen therefore made this copy, which was presumably presented by the official in lieu of the original. This painting is based on the text of Su Shi 蘇軾 or 苏轼 (Su Tungpo, 1037-1101) in his Second (or Latter) Ode to (or on) the Red Cliff, which describes Su and his friends visiting the Red Cliff. Wen Zhengming 文徵明 (1470-1559), Copy of Zhao Bosu’s Second Ode to the Red Cliff 仿趙伯驌後赤壁圖 (1548, original c 1132-1182), ink and colours on silk handscroll, 31.5 x 541.6 cm, National Palace Museum 國立故宮博物院, Taipei, Taiwan. Wikimedia Commons. Viewed overall, there are no clues that this is narrative in nature. The scroll consists of a series of quite different landscape sections, which are integrated into a series of islands dissected by stretches of water. Those do not show any obvious division between scenes, either. Late one evening in the late autumn, Su left for a walk with two friends. He realised that he had no food or wine for them, but one of his friends said that he had been fishing that night, and had caught a large fish. 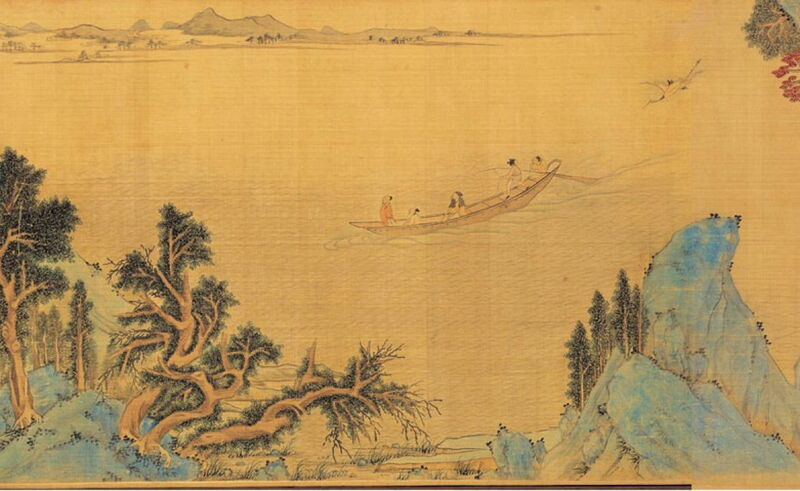 In this first scene, that friend is shown fishing on the river. The deciduous trees have already lost their leaves for the coming winter, and there are small groups of waders at the water’s edge. The second scene shows Su with his two friends discussing their journey, the food and wine. Su decided to return home and speak to his wife about the wine. She had kept a bottle for this occasion, which they collected, and the three set off on their walk. This third scene shows Su taking the bottle (shown prominently in red, in the centre of this view) from his wife. The fourth scene shows Su and his friends using a boat to cross the river, where they started the steep ascent to the Red Cliff. After climbing the steep path among dense vegetation, the three reached the Red Cliff, from where Su thought he could see the palace of the god of the river. By this time, he was alone, as his friends had not followed him that far. The fifth scene shows Su on a narrow path winding its way above the Red Cliff. Below, the waves are dashing against its foot. Su and his companions then boarded their boat, and proceeded out into mid-river to view their surroundings. It was almost midnight, and everything was silent. A crane flew above them and emitted a loud cry before heading off to the west. The sixth scene shows the group being taken out to the middle of the river, and the crane flying far above them (to the upper right). They returned home, and Su Shi slept. He had a vivid dream that night about their walk to the Red Cliff. 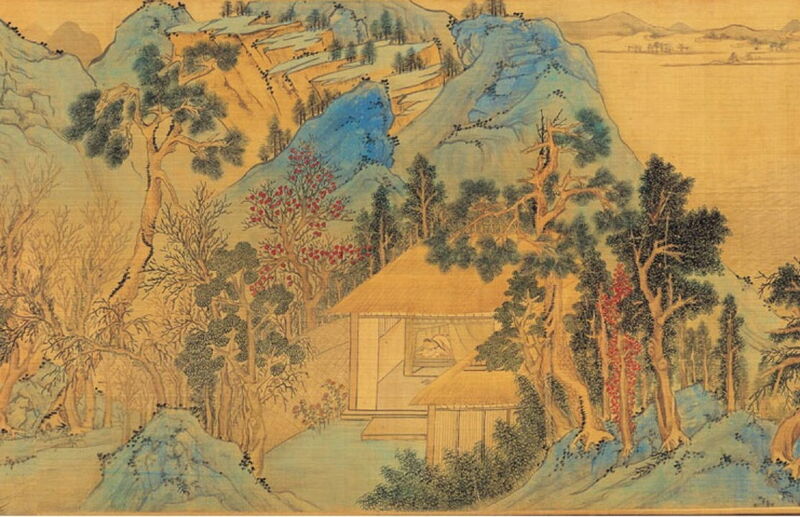 The seventh scene shows him asleep in his house, with a distant reminder of the Red Cliff. The following morning, Su Shi got up, went to his door, and looked out at the landscape. This final scene in the handscroll shows him stood at the door of his house (lower right). Laurent identifies four slightly different copies of this painting, which presumably each derive from Zhao Bosu’s original. The basic form of narrative uses a series of frames, similar to those used in ‘comics’. However, there are some important differences here. Most obvious is the fact that the same location, such as Su Shi’s house, is not shown consistently between frames. Compare scenes 3, 7, and 8, which apparently all show the same house, and the building appears quite different, as do its surroundings. Scene 7 has a background which has most probably been altered deliberately, to refer to the Red Cliff, but scenes 3 and 8 should appear identical. It is only by reference to Su Shi’s original text that that is apparent: visually there are no clues that they are the same place. Another important link to the verbal narrative is the passage of time. Scenes 2 to 7 are set at night, by the light of the moon, but there is no indication that they are. Scene 8 does feature a filled red circle, bearing text, which may be the rising sun, but otherwise there is no indication as to the time of day. In effect, Wen Zhengming, and presumably Zhao Bosu in the original, have told the story primarily in the figures, setting them into frames which reflect limited aspects of the story, but which assemble into a handscroll resembling a single synchronous landscape. This is quite different from normal Western frame-based narrative, as seen in ‘comics’. Wikipedia on Wen Zhengming, in French.